Image: Customers purchase brinjals at a wholesale vegetable market in Mumbai. Bacillus Thuringiensis Brinjal, popularly known as Bt brinjal, is at the centre of a major controversy in India. Bt brinjal, a genetically modified strain created by India's number one seeds company Mahyco in collaboration with American multinational Monsanto, claims to improve yields and help the agriculture sector. However, the debate over the safety of Bt brinjal continues with mixed views from scientists working for the government, farmers and environment activists. Environment activists says the effect of GM (genetically modified) crops on rats have shown to be fatal for lungs and kidneys. It is dangerous to introduce these experimental foods into the market without proper research, they say. A study by French scientist Gilles-Eric Seralini says the tests conducted by Mahyco, the company producing Bt brinjal, were simply not valid and raised serious health concerns. Besides the environment hazards, activists allege that the Genetic Engineering Approval Committee (GEAC) has shown a bias towards companies like the Monsanto. This would be a big threat to India's agriculture with MNCs charging Indian farmers for their seeds. The supply of seeds will be regulated and thus costlier. 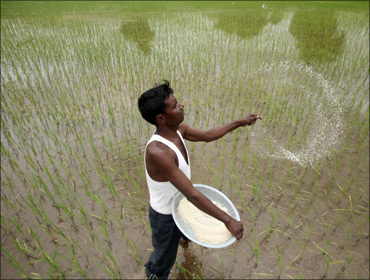 Indian farmers would have to depend on MNCs for seeds. Bt cotton has already been declared a farce with crop failures and mass suicides of farmers in India. What will be the fate of Indian agriculture, farmers and consumers if Bt brinjal and other genetically modified crops are introduced? Bt cotton has already been declared a farce with crop failures and mass suicides of farmers in India. What will be the fate of Indian agriculture, farmers and consumers if Bt brinjal and other genetically modified crops are introduced? Click NEXT to find out. . . 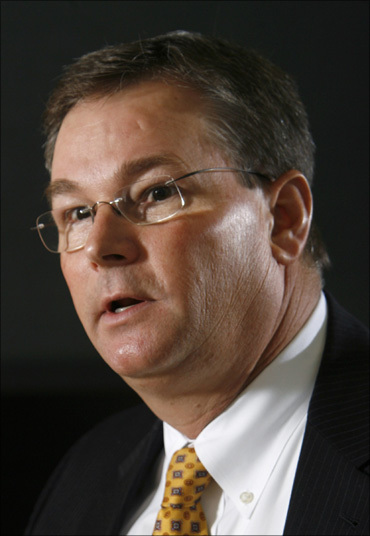 Image: Monsanto executive vice president Brett Begemann. The issue over Bt brinjal gets worse with central government ministers contradicting each other. Agriculture Minister Sharad Pawar reportedly said the committee's decision was final. Meanwhile, Environment Minister Jairam Ramesh said that "the Genetic Engineering Approval Committee may well be a statutory body but when crucial issues of human safety are concerned, the government has every right. . . to take the final decision." Science and Technology Minister Prithviraj Chavan, said he stood by the committee's findings. "After consultations with the stakeholders and other government agencies, the final word will come after February 20 after submitting the report to Prime Minister Manmohan Singh. We assure people of independent and transparent decision over Bt brinjal, it is not going to be taken in a closed room," Jairam Ramesh said. A Ramadoss, Union health minister during 2004-2009, had also opposed the introduction of GM brinjal in India. ... .
A Ramadoss, Union health minister during 2004-2009, had also opposed the introduction of GM brinjal in India. Click NEXT to read on further. . . 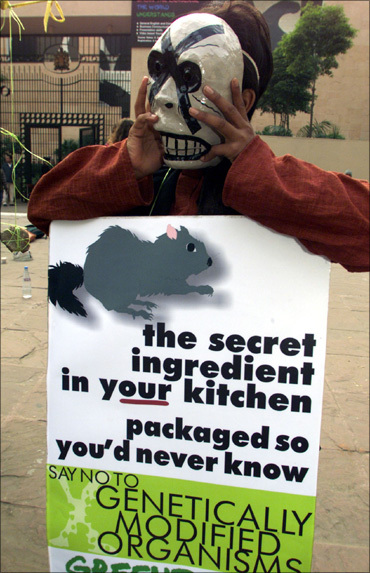 Image: A masked Greenpeace activist shows a sign during a demonstration in New Delhi. In October 2009, the Indian biotechnology regulator, Genetic Engineering Approval Committee which is an ad hoc 30-member committee comprising mainly bureaucrats and scientists, gave its approval for introduction of Bt brinjal, the first genetically modified food crop to be allowed in India. In a GM product, the genetic material is altered to benefit the consumer and producer, as it is pest-resistant and promises to offer a higher yield. Environmental activists have over the years questioned the bio-safety of these products and pointed out that this is a form 'bio-terror' that should be curbed at all costs. 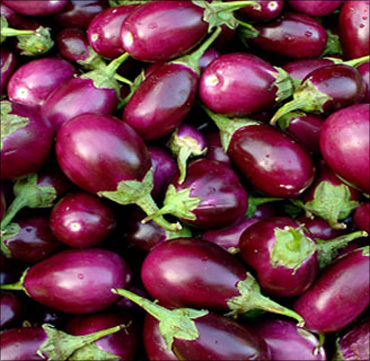 Brinjal has been in India for over 4,000 years. It accounts for half a million hectares of land in India with an output of 8.4 million tonne. If the GEAC decision if approved by the government, it would also lead to other GM food crops, like rice, maize, soyabean, etc in the country. Professor P M Bhargava, GEAC's only independent expert, appointed by the Supreme Court said that a majority of the necessary biosafety tests were skipped before the clearance was given. Meanwhile, the European Union has followed strict norms and countries in the European Union have banned the genetically modified food crops. 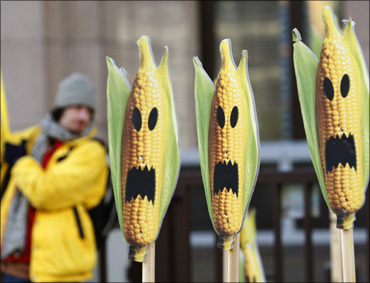 Image: A Greenpeace activist displays signs symbolising genetically modified maize crops. 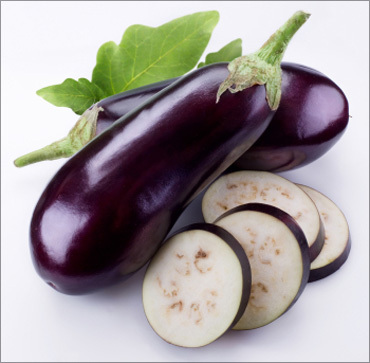 The making of Bt brinjal involves insertion of a gene from the soil bacterium Bacillus thuringiensis into the DNA or genetic code of the vegetable to produce pesticidal toxins in every cell. In an interview with Business Standard, Gilles-Eric Seralini had said, "You may not be aware that 99.9 per cent of edible genetically modified organisms are designed to contain toxic pesticides whose effect on the human body and the environment are not known." "Everything is kept confidential by the biotech companies whose data governments accept without validation. We need many more tests on the environmental and health-safety aspects of GMOs and it should be assessed independently. We want science to be used for the benefit of people, not companies," he added. Image: Brinjals at a market in Mumbai. Bt brinjal has not been properly tested for health or environmental safety. In feeding trials, numerous significant differences were noted compared to the best corresponding non-Bt controls: Bt brinjal appears to contain 15% less kcal/100 gm, has a different alkaloid content, and 16-17 mg/kg Bt insecticide toxin poorly characterized for side effects, and produced by the plant genetically modified for this. GM-fed rats had diarrhoea, higher water consumption, liver weight decrease as well as relative liver to body weight ratio decrease. It may cause diseases like swollen face, itching skins, allergies, et cetera. Moths and butterflies would die and may led to their extinction, if they consume the pollen grains of Bt brinjal. 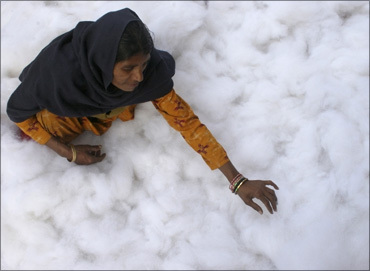 Image: A woman gathers cotton to make a quilt at a workshop in Chandigarh. There have been countrywide protests against the introduction of genetically modified crops. Environmentalist Vandana Shiva also pointed out that the so-called safety tests have not tested for transgenic Bt that includes genes for antibiotic resistance and genes for viral promoters. The tests have been done by the safe microbial Bt. which has been used as an organic pesticide for decades. The tests merely show the safety of the organic spray. They have not looked into the risks that transgenic Bt. creates. This is 'don't look, don't see, don't find' policy to create deliberate ignorance of risks and use this ignorance as proof of safety. Shiva has called for a moratorium on commercial GM approvals as she said "Bt brinjal is a test case for the future of our food, our democracy, our science. That is why it should not be introduced in our farms and our kitchens without a proper reassessment, especially in the context of false assumptions made to present Bt. Brinjal as the only alternative available ignoring the proven agro ecological approach to pest control." Above all, to avoid conflict of interest, developers of GM crops should not be engaged in the biosafety testing, she said. 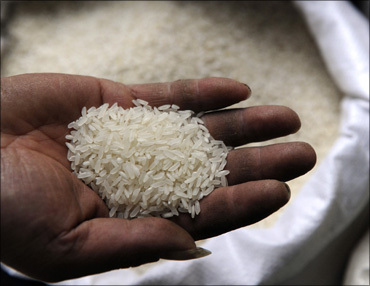 Image: A worker displays a handful of GM rice. Campaigns have also been organised by Greenpeace activists who have demanded long-term tests before Bt brinjal is released into the market. The Bt toxins produced in Bt brinjal are also present in the other Monsanto products such as Bt cotton and Bt corn, they point out. They have been linked to organ toxicity and growth impediments when fed to animals. The governments of West Bengal, Orissa, Kerala, Madhya Pradesh, Chhattisgarh and Bihar have all indicated their opposition to the Union government's plan to approve Bt Brinjal. On March 26, 2002, in spite of inadequate tests of biosafety and viability, Monsanto managed to get clearance for commercial planting of three varieties of genetically engineered Bt cotton from the Genetic Engineering Approval Committee under the Ministry of Environment and Forests (MoEF). Ironically, this permission was granted in spite of an ongoing Supreme Court case, filed by Research Foundation for Science, Technology and Ecology (RFSTE), challenging the 1998 field trials and stating that there were numerous irregularities and violations of biosafety laws and guidelines in previous year field trials. Even then the GEAC have cleared Bt cotton for commercial release by Monsanto-Mahyco. The Research Foundation for Science, Technology and Ecology, Navdanya, farmers unions and public interests groups in India had warned the government that this irresponsible, rushed clearance would have high cost for farmers in terms of the economic sovereignty and seed sovereignty. What we have had predicted has come true.. . 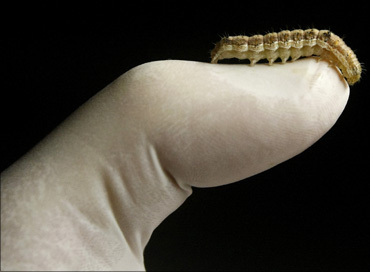 Image: The caterpillar of the cotton bollworm moth (helicoverpa armigera). In three major states Bt cotton has been wiped out completely leaving farmers in great economic and livelihood crisis. Not only have new pests and diseases emerged, Bt cotton has failed in preventing even bollworm attacks for which it has been designed. While Bt cotton is sold as pest resistant seed in India, it has proved to be more vulnerable to pest and diseases than the traditional and conventional varieties. Madhya Pradesh, the heart of the cotton-growing belt in India, witnessed total failure of genetically engineered Bt cotton. The farmers of Khargoan district where Bt is a 100 per cent failure are up in arms against Monsanto-Mahyco that supplied these GM seeds and are demanding compensation from the company for the failure of their crop. The failure of the Bt cotton has devastated the farmers since they have spent five to six times to buy seeds of Bt than the normal seed. The Tamil Nadu government has banned the sale of Bt cotton seeds after it received complaints of crop failure in Dharmapuri district. 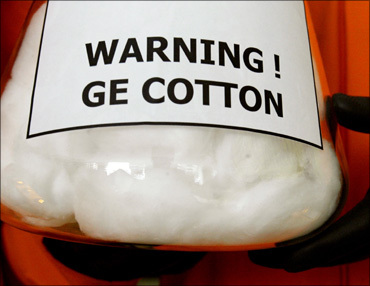 After the GEAC had given approval to Monsanto to launch its Bt cotton technology between 2002 and 2005, Monsanto charged an exorbitant trait value (royalty) of Rs 1,200 per packet of 450 gm. Bt cotton seeds were being sold at an exorbitant price of Rs 1,800 to Rs 2,000 per packet. Based on the complaints of the Andhra Pradesh Ryotu Sangham, the Andhra Pradesh government referred the matter to the Monopolies and Restrictive Trade Practices Commission (MRTPC). The MRTPC indicted Monsanto and passed an interim order stating that the MNC is indeed following restrictive trade practices and this had resulted in some relief for the farmers. The MNCs, however, retain the monopoly over seeds and there is no regulation on them, according to the All India Kisan Sabha. mage: Greenpeace activists hold a bottle filled with GM cotton. Amid the storm over BT brinjal, Mahyco claims that Bt brinjal is resistant to pests and therefore will need less use of pesticides and insecticides, reducing the cost of production. Mahyco collaborates with Monsanto, the world's leading producer of genetically engineered seeds. It sells 90 per cent of the world's genetically engineered seeds. Five giant corporations -- Monsanto, DuPont, Syngenta, Bayer and Dow -- rule the global GM seeds market.